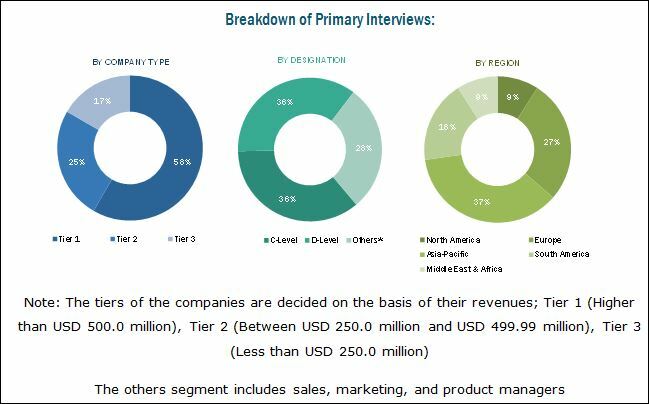 [130 Pages Report] on Polymer Dispersions Market is projected to reach USD 10.27 Billion by 2022 at a CAGR of 8.0%, in terms of value. The base year considered for this study is 2016 while the forecast period is from 2017 to 2022. 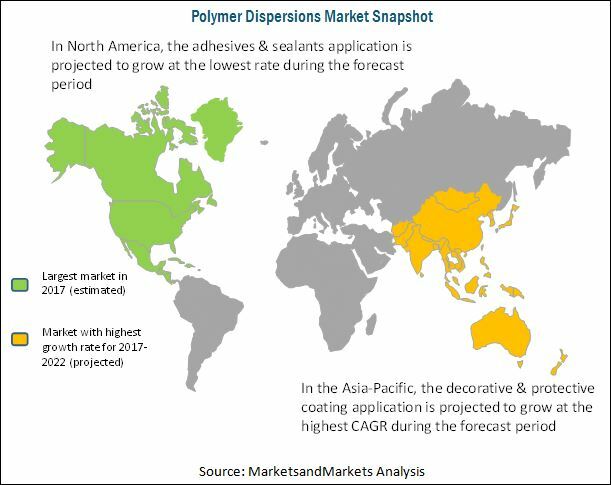 The polymer dispersions market is driven by the increasing demand for polyurethane dispersions and other polymer dispersions from applications such as decorative & protective coating, paper, printing ink, carpet & fabrics, and adhesives & sealants. The report includes an analysis of the polymer dispersions market by region, namely, North America, Europe, Asia-Pacific, Middle East & Africa, and South America. The top-down and bottom-up both approaches have been used to estimate and validate the size of the global polymer dispersions market and to estimate the size of various other dependent submarkets. This study involved the use of extensive secondary sources, directories, and databases such as Hoovers, Bloomberg, Chemical Weekly, Factiva, Commonwealth Scientific and Industrial Research Organization (CSIRO), Securities And Exchange Commission (SEC), American National Standards Institute (ANSI), Organisation for Economic Co-operation and Development (OECD), and other sources, to identify and collect information useful for the technical, market-oriented, and commercial study of the polymer dispersions market. The key market players in the polymer dispersions market include BASF SE (Germany), Synthomer Plc. (Germany), Mitsui Chemicals (Japan), Covestro AG (Germany), and Solvay SA (Germany). These companies are focusing on expanding their reach in the emerging markets of Asia-Pacific and South America. There is many domestic players in the emerging markets. This research report categorizes the polymer dispersions market on the basis of resin type, application, and region. Country-level analysis of the polymer dispersions market is provided by application. The global polymer dispersions market is projected to reach USD 10.27 Billion by 2022 at a CAGR of 8.0%, in terms of value. Polymer dispersions are used in a wide range of applications such as decorative & protective coating, paper, carpet & fabrics, printing ink, adhesives & sealants, and other applications, as it provides properties such as enhanced processability, performance, and appearance to products. The properties of these dispersions are similar to those of emulsions. The major difference is the particle size of the polymer particles. The main resin types are acrylic, vinyl, PU, and SB, among others. The acrylic dispersions segment is projected to lead the resin type segment of polymer dispersions in terms of value and volume, during the forecast period. This is due to the wide usage of acrylic dispersions in the manufacture of water-based coatings for decorative and paper coating applications. The cost effectiveness of acrylics over other types, is also leading to the high demand for this subsegment. Polymer dispersions are used in various applications, and have been segmented into decorative & protective coating, paper, carpet & fabrics, printing ink, adhesives & sealants, and others, in this report. In 2016, the decorative & protective coating application accounted held the largest share of the application segment, in terms of value and volume. This is due to the increasing housing projects in the emerging markets and the increasing consumer awareness regarding VOC contents associated with solvent based substitutes. BASF SE (Germany), Synthomer Plc. (U.K.), Mitsui Chemicals Inc. (Japan), Eastman Chemical Company (U.S.), Covestro AG (Germany), and Solvay SA (Germany) are the leading companies in this market. Most of the market players adopted new product launches, merger & acquisition, and investment & expansions strategies, to maintain their share of the market.